The new Kral NP02 has immediately set the shooters world on fire. |It represents fantastic value for money from a European manufacturer. 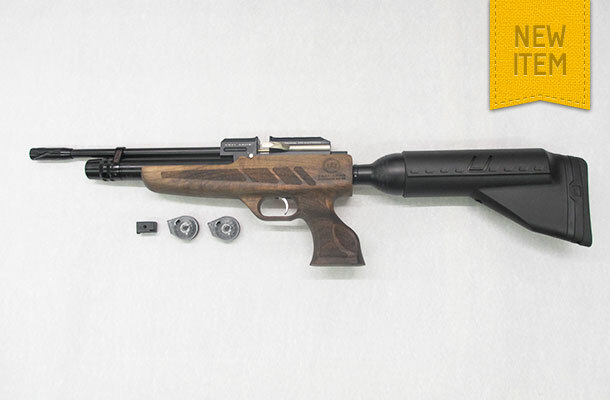 This super carbine weighs only 2.9kg and has an overall length of 815mm. Features include – left hand positioned side lever cocking, magazine feed, two stage trigger, pressure gauge, variable power setting, two magazines, single shot “tray”, side safety, and hard case. The magazine capacity is 14 shots in .177 and 12 shots in .22. The shot count from each fill is approximately 180 shots in .177 and 200 shots in .22. The gun is filled by means of the probe supplied and to comply with the law the gun cannot be fired if the bottle is removed.